Artist's rendering of the Cornell Complex in Joplin, proposed future home of Connect2Culture and the Spiva Art Center. Emily Frankoski, Community Arts Director for Joplin's Connect2Culture, helps us inaugurate a new monthly feature on KSMU's Arts News program: "Spotlight on Joplin." “We were founded in 2009 to build a new performing and visual arts center to improve quality of life in Joplin. And that project is still ongoing. It has actually moved through different locations and iterations, but we finally settled on a spot for it, right on the parking lot of our Memorial Hall in downtown Joplin. It will be called the Harry M. Cornell Arts and Entertainment Complex, or ‘The Cornell Complex’ for short. We’re in a capitol campaign for that right now. 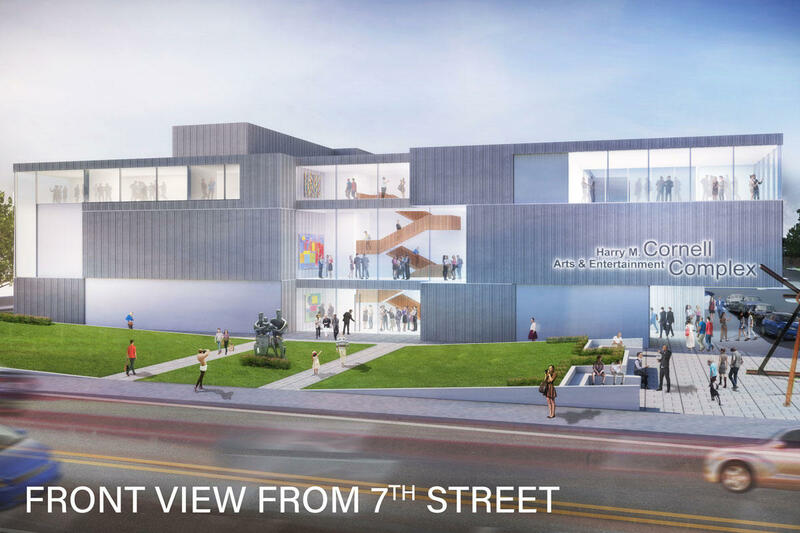 We hope to have it built for the fall of 2021.” Connect2Culture will share the facility with the George A. Spiva Center for the Arts, Joplin’s visual-arts gallery. So what are some of Emily’s picks for outstanding cultural events in Joplin in April 2019? “There are so many,” she says. “I tried to narrow it down.” She starts by highlighting National Poetry Month celebrations in Joplin. “We’re going to have a poetry reading at Missouri Southern State University in their English Department with Alan Berecka, a Pushcart-nominated writer, and I believe he was also the (first) Poet Laureate of Corpus Christi, Texas. So he’s coming to do a sampling of his writings.” That’s on Tuesday, April 2nd at 7:00pm in Spiva Library Room 413 on the MSSU campus in Joplin. “And then on April 15 we have a Downtown Poetry reading. They’re a group that meets on the third Monday of each month, and they have poetry reading and an open mic. This month they’re going to spotlight Dr. Lisa Lewis. And on April 16 we have the ‘1000 Words’ event at Spiva Center for the Arts. They do this every year, and it’s one of my favorite events.” It takes place in conjunction with the Center’s “PhotoSpiva 2019,” a national juried photography exhibition held every year at Spiva. “Writers go to Spiva, pick out a photo, and create poetry or prose inspired by the photo. On April 16 all the writers come together to recite their poems.” They also audio-record their writings on Soundcloud, which will be available for playback via a QR code placed next to the photo they have written about. People visiting the exhibit can scan the code and listen to the writers reciting their poetry or prose as they view each photo. “On April 18,” continues Emily Frankoski, “we have ‘National Poem in Your Pocket Day.” It’s held in conjunction with Joplin’s monthly Third Thursday Art Walk. “We print out miniature poems on little baby scrolls, we roll them up, then literally go throughout town, place them at venues, hand them out. Basically, it’s a national celebration of poetry. You just take (the scroll), carry it with you, share it with others, and enjoy it.” Third Thursday runs from 5:30 to 8:30pm in downtown Joplin. “And then we’ll wrap up National Poetry Month on April 19 with our ‘Open Mic Poetry Night,’ and this is for people that write poetry—or people that don’t write poetry and just love poetry. You pick out a poem, you come and recite. It’s a very casual atmosphere. You can bring some craft beers or a bottle of wine to share—it’s an age 21+ event, with free admission.” That’s at 7:00pm on April 19 at Joplin Empire Market, 921 E. 4th Street. Connect2Culture itself is promoting the return of Joplin native, singer-songwriter Grant Landis, to perform on Saturday April 13 at 7:30pm at Joplin Memorial Hall. Frankoski says “we’re really excited—we’re gearing up for Grant Landis. He has really grown an online following from the days of Vine, a social-media site where you uploaded a video and it just kept looping and looping and looping. Eventually he went on to star in Lifetime’s reality TV show ‘The Pop Game,’ where he worked with (producer/songwriter/performer) Timbaland. Most recently he has moved to Nashville, really taking the next step in his career as a musician, and released his newest music video called ‘Home to Momma,’ which is definitely an earworm! I find myself just humming the wherever I am.” Tickets for Grant Landis are $20 general admission. “Another fun performance that’s going on is Pro Musica’s jazz concert with the Aaron Diehl Trio on April 13. This is their annual jazz concert. It’s a ticketed event, $10 for adults and $5 for students. They’re hosting it at Missouri Southern State University (in Corley Auditorium).” Start time is 7:30pm; for information visit www.promusicajoplin.org. You can find out more about these and MANY other Joplin-based events—performances, exhibits, ongoing classes (“there’s something for everyone,” says Emily Frankoski)—at www.connect2culture.org.